Rapidly rising energy prices over the last decade have put many tenants into fuel poverty and increased financial strain on tenants, making it more difficult to pay rent. At the same time, expectations of comfort levels in our homes have risen. Period properties retrofitted to achieve modern standards of insulation (while preserving their character and beauty) make for happy tenants who are more able to pay the rent and remain in the property for longer. Minimum Energy Efficiency Standards (MEES) came into force in April 2018 and require rented properties to have a minimum EPC rating of E. This is expected to rise to D in 2023 and C in 2030. For many old properties this means improving loft and sloping ceiling insulation, draught proofing, secondary glazing and sometimes heating systems, among other measures. The UK has legally committed to reducing CO2 emissions by 2050 and this can only be achieved if Britain’s old housing stock is fully insulated. 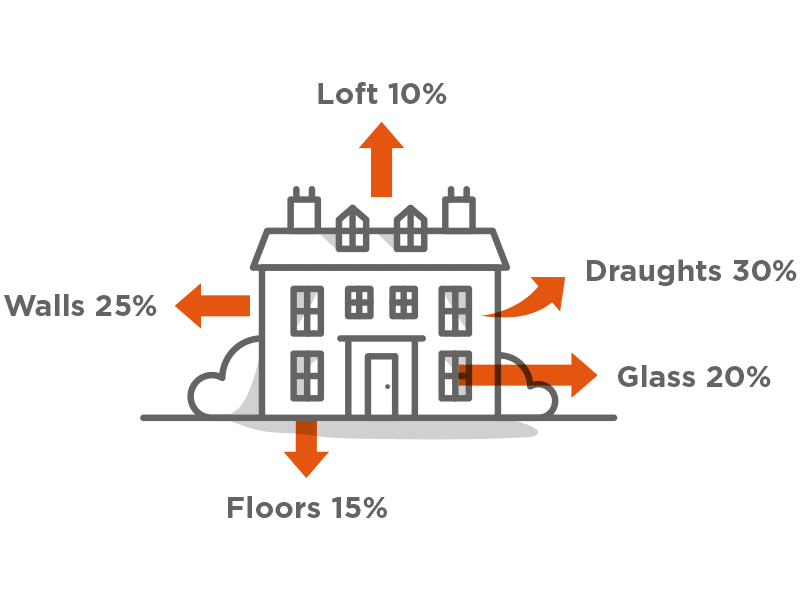 Heat loss in a typical three bedroom detached house is shown as above. Loft and sloping ceiling insulation, draught proofing and secondary glazing can save 40 – 50 per cent of heat loss in an older property. Case studies show tenants reporting greatly increased warmth and comfort with fuel bills reduced by half. In terms of EPC ratings, the above insulation measures in some cases take properties from G rating up to the required E rating. In other cases, the addition of high heat retention storage radiators is necessary to reach E rating and sometimes D rating is achieved.